Our product range includes a wide range of power lift hoist. Reliability and safety are the most desirable features for an electric wire rope hoist. 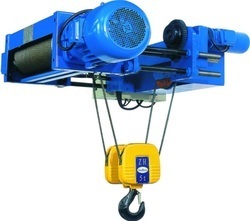 Hence we use best quality electric wire rope hoist made using advanced technology. Our electrical hoist wire are suitable for medium and heavy duty operation. The modular construction allows easy accessibility of components for maintenance. Components like rope drum, gear box, motor brake and panel can be easily attended.